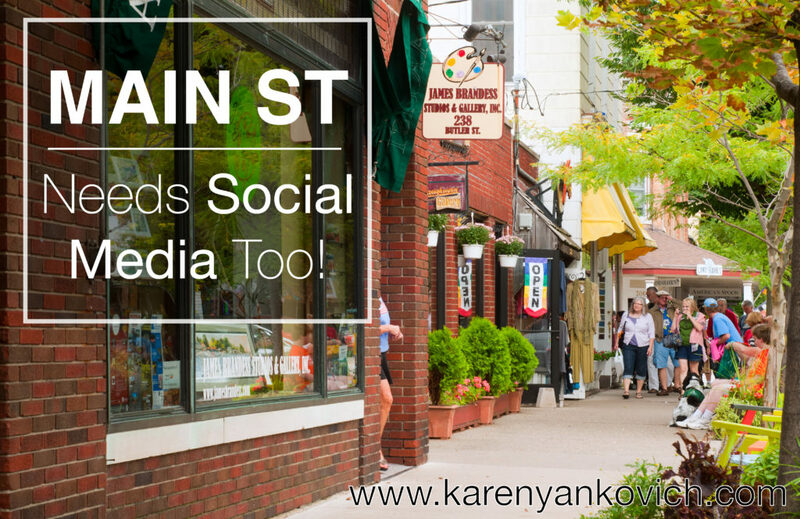 Main Street Needs Social Media Too! We hear a lot about social media, the great equalizer, shrinking the world, allowing us to do business with people across the globe. That’s representative of MY business! I’ve got clients on continents I’ve never been to (yet! ), that I will likely never meet. But what if you have a location based business? A business that has no marketing need to reach people across the pond? Become a more integral part of the community – Share local news, support and interact with other local businesses, and post content relevant to events going on in the area. People will start to see your business as a hometown favorite! Make customers feel more connected to your business – Interact with customers before they even set foot in your shop, and continue the conversation after they make a purchase to keep them coming back! Target your ideal customer – Are you focused on a niche market? Do you only deliver to certain zip codes? Strategically using tools like targeted Facebook ads and location-based hashtags will help you attract customers based on their niche interests or proximity to your business. Amplify word-of-mouth – Word-of-mouth is a major driver of customers for most small businesses. Social media provides an easy way for happy customers to share experiences and allows the positive impression you made on them to spill over to all of your local fans. Utilizing social media marketing has become the norm for small businesses. With a solid strategy and the right content, social media can help you reach local customers and increase profits. Not sure where to start? Head over to socialmediaandpr.com for some insider secrets that will give you a jumpstart to get local exposure fast!